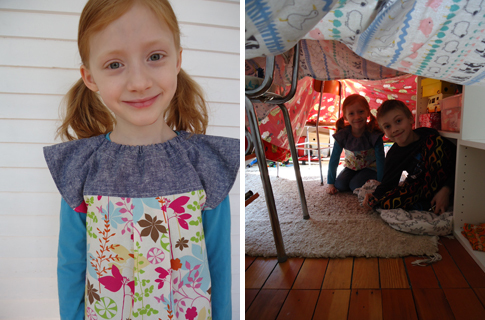 I finished up Ellie's new tunic last week and I'm happy to say, she loves it! I followed the Emerson tunic dress tutorial, but re-drafted the pattern for about a size 6, kept it short-ish (so it's more of a top than a dress), and divided the back into two sections like the front, so I could use this awesome Essex yarn dyed linen/cotton in denim for the yoke. The patterned fabric is something I bought at Hobby Lobby years ago. I didn't add the decorative buttons, bird applique, or the strip in the back that the tutorial calls for. I didn't think it needed those extras, plus Ellie and I thought the buttons down the back might make it uncomfortable for sitting. The sleeve/shoulder/side seam construction is a bit unusual: you turn under and hem the sleeves and side seams first, then stitch the side seams together. I would never have thought of constructing a garment this way, but it ends up making a pretty nice silhouette. I really like how it turned out overall, but I'm most proud of the inside. Every single seam is finished! I repeat: there are no raw edges anywhere on this garment. 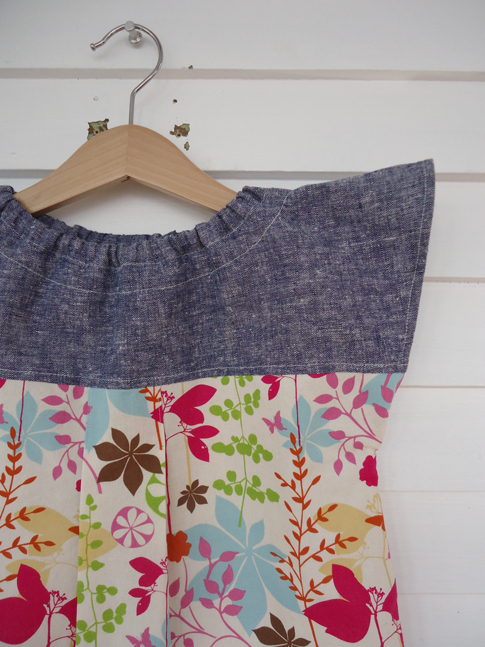 I used a flat-felled seam to join the yoke to the patterned fabric, and french seams at the top of the sleeves. The side seam construction called for in the tutorial results in a finished side seam, and the extra fabric strip at the inside of the neck line hides the raw edges there. Can you tell I'm feeling kinda accomplished here? Newly received fabric ordered from SewMamaSew! Isn't it lovely? I have purposes for some of these, but not all -- for now, I'm just gazing at them. 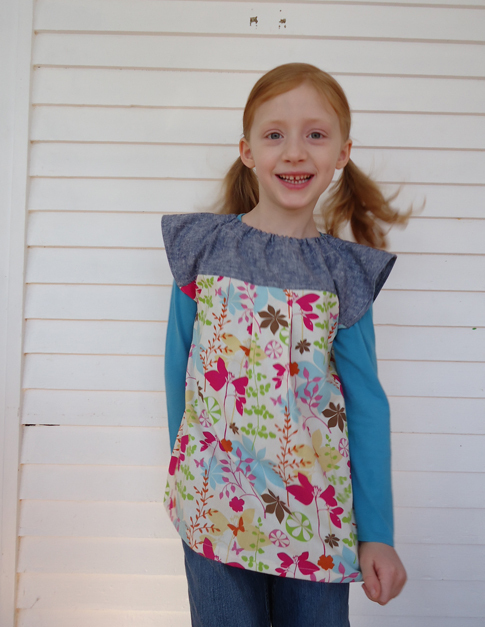 Making Ellie this Emerson tunic. Tutorial and pattern from luvinthemommyhood. 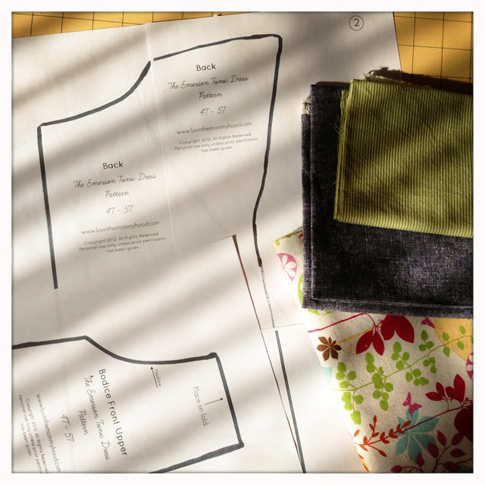 It was fun picking out the fabric from my stash with Ellie. 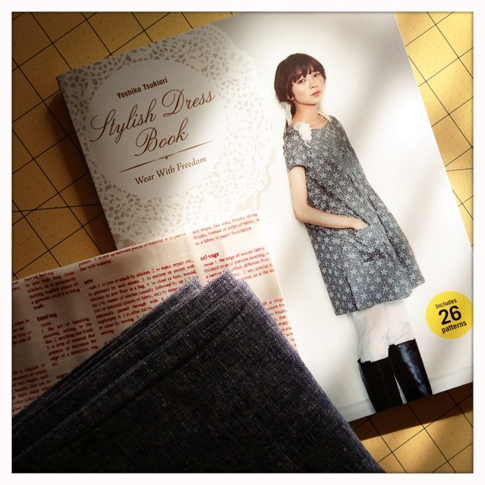 Making the cover dress/tunic (Style E) from the Stylish Dress Book for myself. I'm thinking of using the text fabric for the neckline facing, and maybe the pocket lining. What do you think? And this is an in-progress secret project for a book. Next: a couple of swaps. I've really been enjoying swaps! 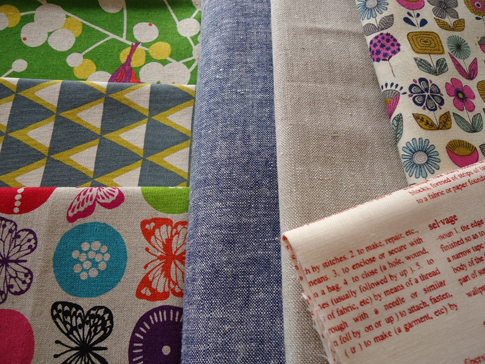 There's still time to sign up for Handprinted: a fabric swap, hosted by Leslie of maze & vale. If you've ever wanted to experiment with any kind of printing onto fabric, plus get some amazing handprinted fabrics in return, then this is for you. I participated last year and am very much looking forward to doing it again this year. Sign ups are also open for the Covert Robin mystery gift exchange. This swap has multiple hosts, including Rachael of imagine gnats. Make a gift, get a gift, and blog about the gift you made or received for a chance to win fun prizes. I didn't participate last year, but wish I had. 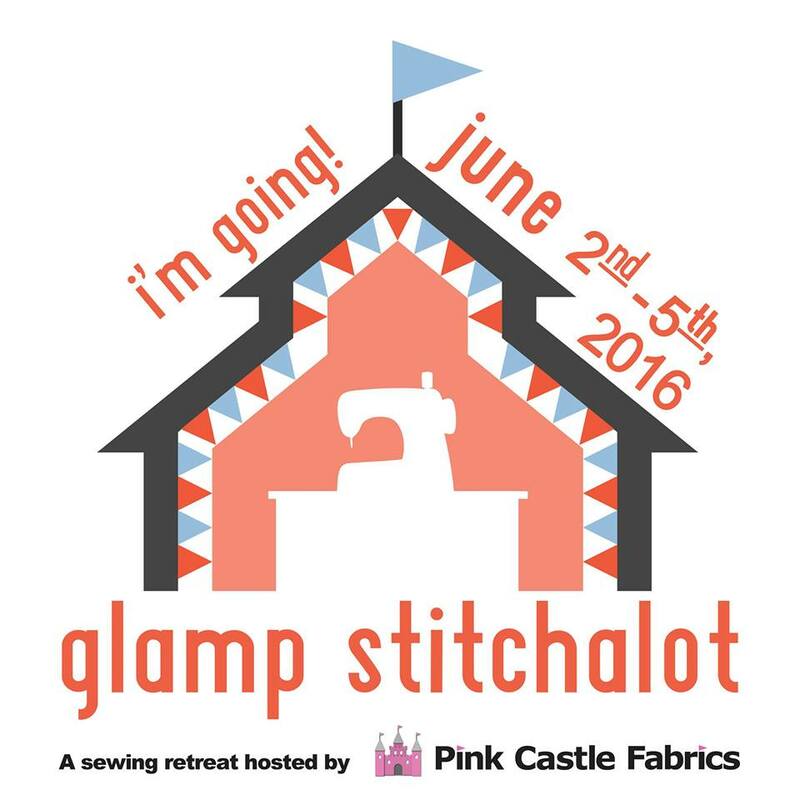 So I'm excited about taking part this time! 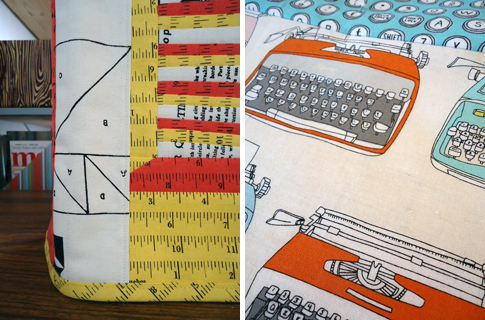 Finally: here's a sneak peek at two projects I recently sent off to Stitch magazine for their Fall 2013 issue. I also have a project in their soon to be released Summer issue. More on that soon. What's on your cutting table today? 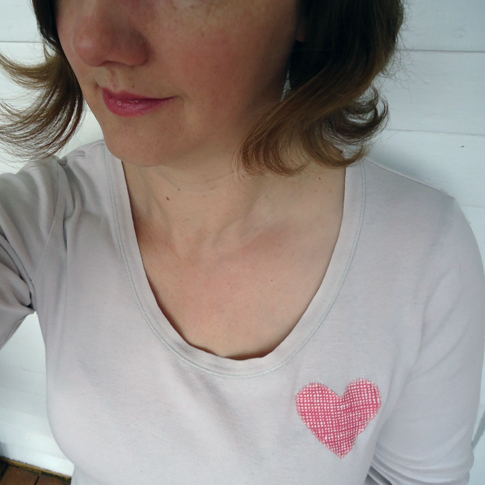 With Valentine's Day just two days away, I thought I'd post this quick and easy idea for embellishing a t-shirt with a delightful raw-edge appliquéd heart. You really can do this in about 10 minutes. 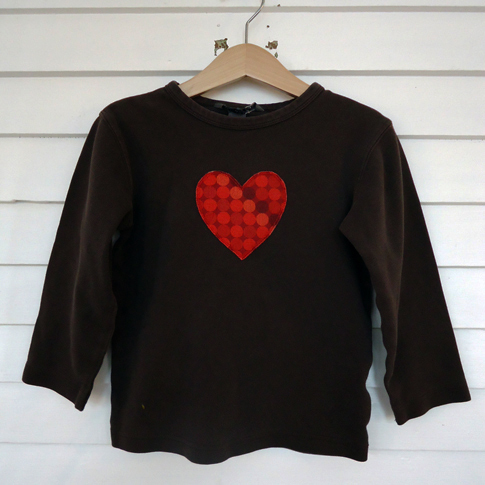 In fact, I embellished the shirt above for my son one Valentine's Day morning when he requested a heart shirt about 20 minutes before he needed to be at school. In that case, I only had about five minutes to spare, so I ironed the heart to the shirt and waited until later to stitch it on. This is one I made for him a few years prior. I think we realized that it no longer fit that frantic morning when I quickly made a new one! My daughter now wears this brown one. Yesterday, I decided that I needed one, too! Here's the result. And I can honestly say that once I chose a t-shirt and the fabric, it really did only take 10 minutes -- maybe less. 1. Fold the card stock or paper in half and cut out half of a heart shape along the fold. Unfold for a perfectly symmetrical heart shaped template. 2. 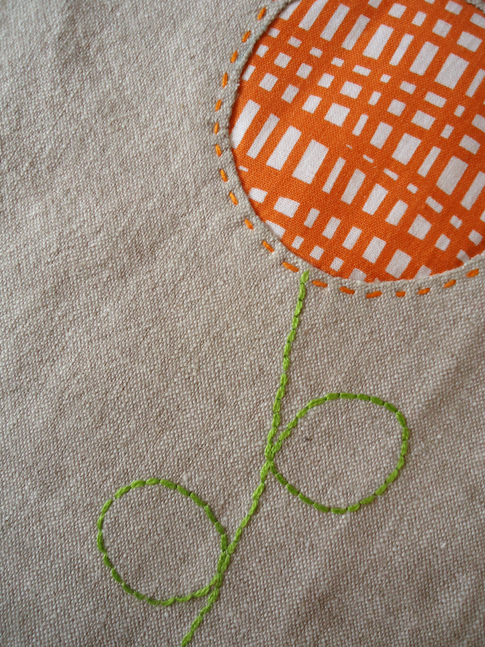 Using a pencil or permanent marker, trace your template onto the paper side of the fusible web. Cut the shape out of the fusible web, leaving roughly a 1/4" border on all sides. 3. Following the manufacturer's instructions, iron the fusible web to the wrong side of the fabric scrap. Allow to cool for a minute. 4. 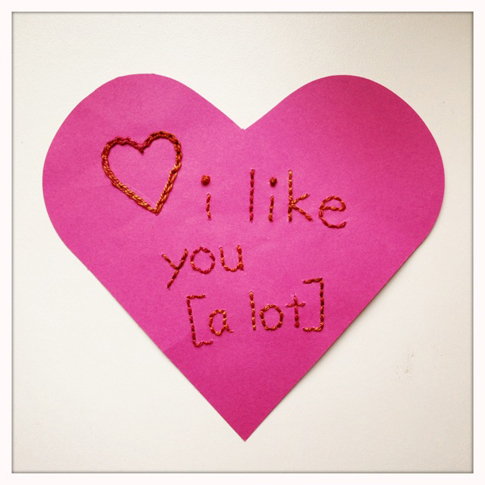 Cut out the heart, following the lines you drew on the paper backing, then peel off the backing. 5. 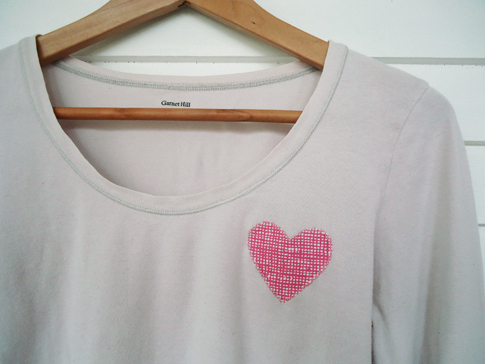 Place the heart on your t-shirt and (again following the manufacturer's instructions) iron it to the shirt. 6. Finally, stitch close to the edge of the heart to securely attach it to your shirt. Use a straight stitch, a zigzag, or another fancy stitch you like. Or hand stitch with colorful embroidery floss. Or simply forget this step if you're not concerned with the heart eventually coming detached in the wash -- it'll probably hold up through several washings, although I can't guarantee that! Here I am in my new shirt. Look, I even managed to match my lipstick to the color of the heart! How did that happen?! I'd love to hear about it if you make your own heart shirt. Post in the comments, or email a photo or photo link to me! 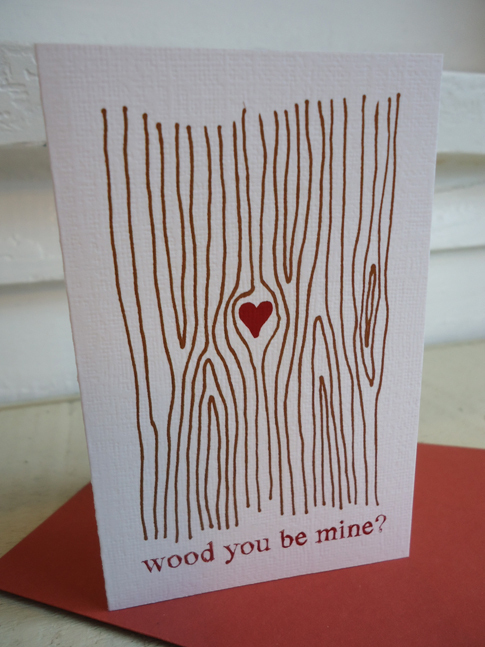 I made these cards last year while preparing for a craft fair that took place just before Valentine's Day. I'm a sucker for pretty much anything faux bois, and I liked the idea of a heart shaped knot within the wood grain pattern. I couldn't help but add this little pun. After all, isn't Valentine's Day just an excuse for silly plays on words?! These are set up to print four cards to an 8.5" x 11" page. There aren't any tick marks on the printable. Just print full size on a decent quality cardstock, then cut the page in half lengthwise, then again crosswise. You will end up with four cards that, when folded, are 2.75" x 4.25". The cards will fit in a #5 coin envelope or a standard 3.5" x 5" envelope. I lucked out and found some red envelopes in this size at my local craft store. This is what the printable sheet looks like. 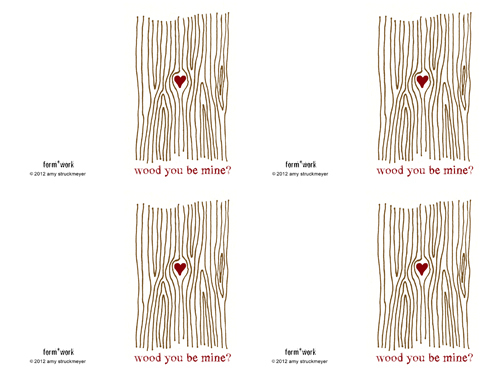 Go here to download your own Wood You Be Mine printable pdf. 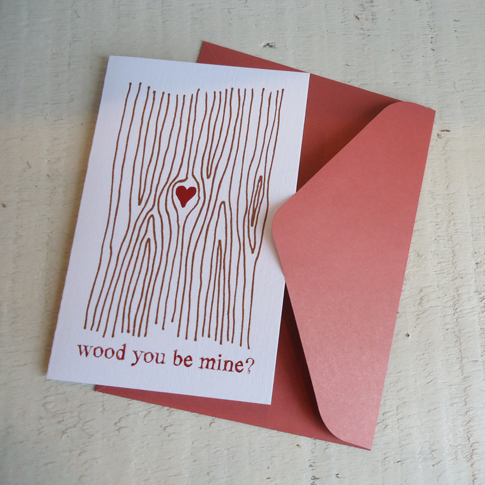 Happy silly pun day, er, I mean Valentine's Day! It's all packaged up and ready to ship first thing Monday morning. 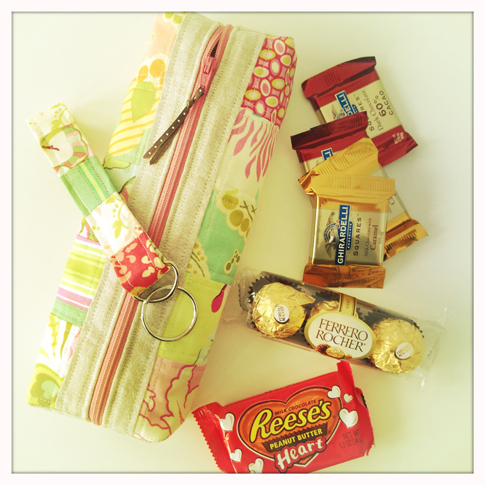 Here's the pouch I made for the Sweet Pouch Swap, hosted by Ros of Sew Delicious. I can't say who my swap partner is yet (it's a secret! ), but I sure hope she likes it! For all the sewing I do, I don't really quilt much (okay, almost never). So I thought I'd like to work on new skills and try a quilty type pouch. I followed the boxed pouch tutorial from Terrabyte Farm. I've been eyeing this pouch for a while now. I followed the tutorial pretty precisely, with the exception of the quilting, which I did differently, to reinforced the grid of patchwork. Look, Ma! 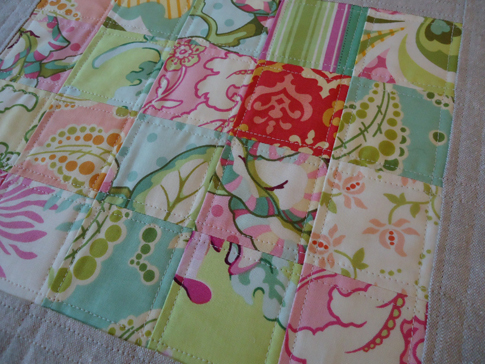 I quilted! And the little patchwork corners even line up! 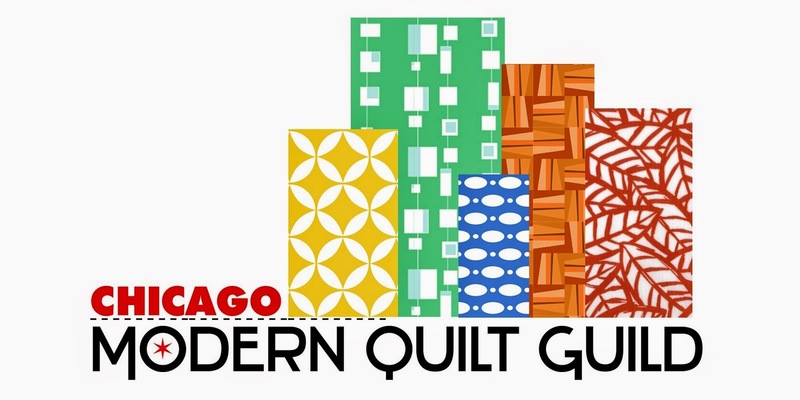 Really, folks, my mom makes beautiful quilts and even quilts them by hand -- she enjoys it -- so I think she'll be proud of me. I did not hand quilt, but pulled out my walking foot (for maybe the third time ever) and quilted this little bugger by hand. It is so amazing to see the way it all comes together with the quilted stitching, and I feel like I'm getting closer to making an actual, real, full sized quilt. Here's one more pic of the pouch (to show the lining), plus a photo of the patchwork key chain I made to go along with it. For both pouch and key chain, I used a charm square pack of Freshcut fabrics from Heather Bailey with baby pink and mint green, since my swap partner said she likes those colors. Soon, these goodies will be flying across the Atlantic! 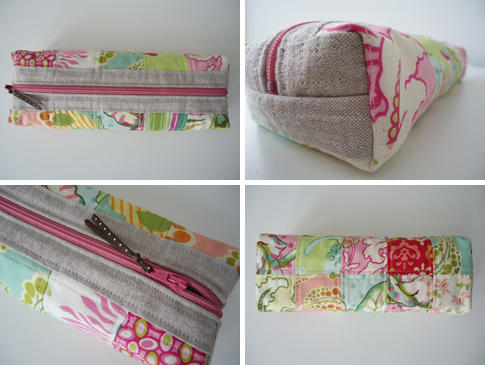 Also, be sure to check out the Sweet Pouch Swap Inspiration board on Pinterest for lots of great pouch ideas and tutorials. My friend Lisa was first asked to do this project. Fortunately for me, she was swamped with custom skirts and other clothing orders before the holidays. She thought I might be interested in taking on the job instead, and she was right. I'll start with a background summary. (I'll call my client by her first initial only, just because I'm not sure if she would be okay with me using her name, and I'd like to surprise her with this post.) Sadly, E's father died last year. 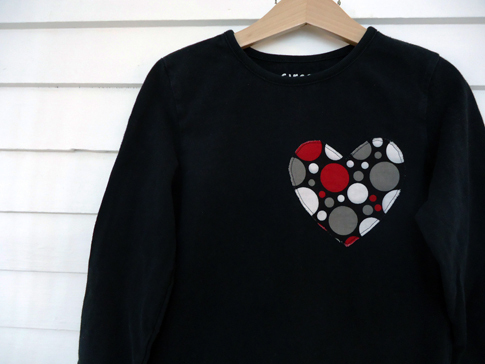 Her mother saved some of his favorite sweaters, and both E and her mother wanted to use them in a way that would preserve their (and his grandchildren's) memory of him. 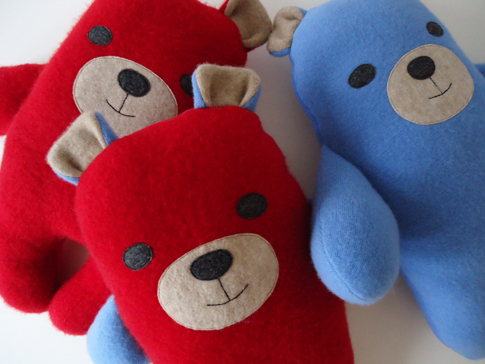 E came up with the idea of making them into bears -- one for each of her three children -- to be given as Christmas gifts. This is where I come into the story. E wanted three bears that were cuddly and soft, and each slightly different from the other. Other than those basic parameters, she gave me complete freedom with the design. She also gave me three sweaters to work with. One was cotton and couldn't be felted, but the other two (one red and one blue) were soft and luxurious cashmere. When I felted them, they grew even softer and more lovely. Since I wanted the bears to be substantial enough in size for good quality snuggling, I used fleece (to match the now-shrunken-sweaters) for the back of each one. 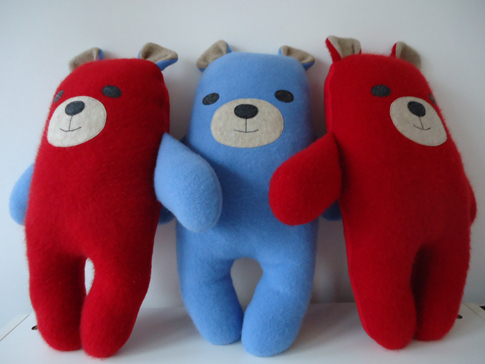 This allowed me just enough sweater fabric to make the bears about 18 inches tall: one red, one blue, and one a combo of both colors. I used an oatmeal-colored felted sweater from my own stash for the inside of the ears, and acrylic felt sheets for the faces. Everything else was cut and sewn from E's father's sweaters. I sometimes got a bit teary while I worked on these -- they wouldn't exist if not for the deep loss of a loved one. But I also really love the idea of this project, as well as the medium. I've been fascinated for a long time with memory: how we remember things, people and events, and the objects that spark or help us retain those memories. And this seemed like such a perfect and positive way for a child to be reminded of their grandfather. I also always enjoy sewing with beautiful, tactile, and repurposed felted wool, especially cashmere! The best part of this project, though, was the message I received from E just after Christmas: "Just wanted to let you know how much my mom and the kids loved their grandpa bears. My mom was thrilled when she saw them and the kids absolutely love their bears. My 10 year old said it was by far her favorite gift." What do you think? Would you like to see a tutorial for these "memory bears"? I already have a pattern and I actually remembered to take took photos during the making process, so, if there's an interest, I'd be happy to share these.